Winter can be a wonderful time for outdoor photography with low sun angles, unique atmospheric conditions and landscapes that are magically transformed. Winter can also be a challenging time to shoot too, beyond the obvious reason that it’s cold! Everything related to the camera and access to locations is more difficult than in summer but the rewards are more images that you’ll hang on to. Before you take a step outside into the cold and snowy winter wonderland, a little preparation is needed to ensure you’re comfortable behind the lens. It’s challenging to make comforting images if you aren’t comfortable to begin with!Here are a few tips I can offer for shooting when the temperature drops and snow covers the land:Hand warmers – These packets of awesomeness are a game changer. Cold hands are a thing of the past and if your hands do get cold for a moment, these little warmers feel even warmer. Simply slide them inside your mittens and your hands stay warm. Simple as that! Be sure to activate the warmers before you step outside though, ensuring they actually work. Occasionally, you’ll get a defective one and you don’t want to find this out when you’re outside. Trust me. Benediction, originally uploaded by killy keng. With its origins in the aftermath of the French Revolution among ultra-Catholics and legitimist royalists, developed more widely in France after the Franco-Prussian War and the ensuing uprising of the Paris Commune of 1870-71. Though today it is asserted to be dedicated in honor of the 58,000 who lost their lives during the war, the decree of the Assemblée nationale, 24 July 1873, responding to a request by the archbishop of Paris by voting its construction, specifies that it is to «expiate the crimes of the communards». Montmartre had been the site of the Commune’s first insurrection, and many hard-core communards were forever entombed in the subterranean galleries of former gypsum mines where they had retreated, by explosives detonated at the entrances by the Army of Versailles. Hostages had been executed on both sides, and the Communards had executed Georges Darboy, Archbishop of Paris, who became a martyr for the resurgent Catholic Church. 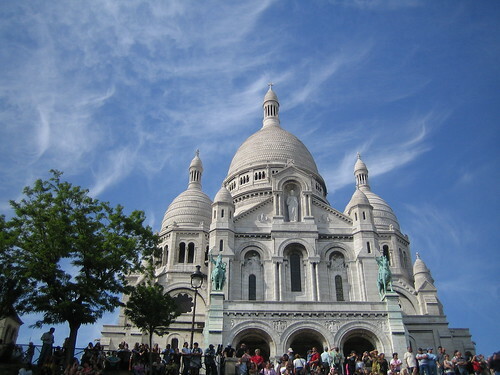 His successor Guibert, climbing the Butte Montmartre in October 1872, was reported to have had a vision, as clouds dispersed over the panorama: «It is here, it is here where the martyrs are, it is here that the Sacred Heart must reign so that it can beckon all to come». In the moment of inertia following the resignation of the government of Adolphe Thiers, 24 May 1873, François Pie, bishop of Poitiers, expressed the national yearning for spiritual renewal— «the hour of the Church has come»— that would be expressed through the «Government of Moral Order» of the Third Republic, which linked Catholic institutions with secular ones, in «a project of religious and national renewal, the main features of which were the restoration of monarchy and the defense of Rome within a cultural framework of official piety», of which Sacré-Cœur is the chief lasting triumphalist monument. The decree voting its construction as a «matter of public utility», 24 July, followed close on Thiers’ resignation. The project was expressed by the Church as a National Vow (Voeu national) and financial support came from parishes throughout France. The dedicatory inscription records the Basilica as the accomplishment of a vow by Alexandre Legentil and Hubert Rohault de Fleury, ratified by Joseph-Hippolyte Guibert, Archbishop of Paris. The project took many years to complete. Η Τηνιακή Μαρμαροτεχνία στον κατάλογο Άυλης Πολιτιστικής Κληρονομιάς της UNESCO! το βιβλίο συλλυπητηρίων του Κάστρο είναι ένα «who is who» όλων των αυταρχικών ηγετών του κόσμου. A strange and beautiful sight greeted locals in the Gulf of Ob, in northwest Siberia, after thousands of natural snowballs formed on the beach.An 11-mile (18km) stretch of coast was covered in the icy spheres.The sculptural shapes range from the size of a tennis ball to almost 1m (3ft) across. Stress at work is an issue that is often overlooked by employers. Given its psychological nature, organisations can feel out of their way when it comes to dealing with work-related stress. It’s nonetheless one of the greatest problem of today’s modern society. Workplace stress corresponds to the feeling of employees who experience a disconnection between the tasks they need to accomplish and the resources they have available to complete it. This situation creates a physical and psychological reaction that is generally translated by high levels of stress and anxiety. Given the disastrous consequences workplace-related stress can have on our lives, it’s important to moderate stress levels by identifying the causes of that stress. A recent workforce survey organised by Wrike has revealed some of the top sources of stress we experience at work. From a lack of information to doing overtime too often, or even poor leadership, we offer you solutions to tackle those 12 issues and make your organisation a better place to work.